In this podcast I will answer the question: How can I make more money in the stock market? I spoke with a fellow financial planner at a recent professional meeting who used to be a day trader. He told me that he would have stretches of good success and then down times that would wipe out all of his gains. He said that with the high speed trading that goes on today, there is little room for profit for small day traders. He now follows an asset allocation approach. Some are simple and try to keep up with inflation and the growth of the economy. Some try to achieve above market return. Some are very risky with large downside potential. This is what I am most familiar with. The approach is to define a distribution of your assets in different classes (bonds, stocks, foreign, real estate, …), buy those investments and for the most part hold them. The strategy involves regularly rebalancing to the original plan to avoid over or under exposure in any one sector and to sell when a sector is high and buy when it’s low. This can be accomplished using stocks, bonds, mutual funds and/or ETFs. Generally, you invest in broad market exposure and you try to match the market returns. This strategy does not try to guess winning and losing sectors, it will just grow with inflation and the economy. Similar to Strategic Asset Allocation but includes short-term, tactical deviations from the investment policy (or original mix) to try to make additional money on unusual or exceptional investment opportunities. This flexibility adds a market timing component to the portfolio, allowing you to participate in economic conditions more favorable for one asset class than for others. Another active asset allocation strategy is dynamic asset allocation, with which you constantly adjust the mix of assets as markets rise and fall, and as the economy strengthens and weakens. Financial analysis (also referred to as financial statement analysis, accounting analysis or analysis of finance) refers to an assessment of the viability, stability and profitability of a company. This approach emphasized companies’ fundamentals, such as: debt, cash flow, earnings per share, price per share, dividends, growth in earnings, return on equity, assets, etc. The investment decision is based on the information about the company. This strategy does not consider the fundamentals of a company. Technical analysis (or chart analysis) looks at trends in the movement of a stock’s price, using price charts, to forecast future price direction. The thought is that patters if you can recognize patterns in the price movement, you can take advantage of that. Technical analysis has many critics – specifically from the efficient market hypothesis (EMH). This theory states that it is impossible to “beat the market” because stock market efficiency causes existing share prices to always incorporate and reflect all relevant information. The contrarian approach is to choose assets that are out of favor or far down in price. 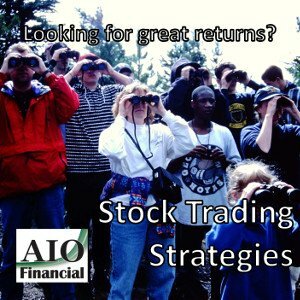 Trade stocks with a share price of less than $5. There are many scams at this price where people try to pump the price up then sell. Invest stocks with a strong record of earnings and dividends. Because of the stock market volatility of recent years, many investors like the idea of a fund that offers them a regular payout. Even if the price goes down, at least you’re getting some income. The disadvantage is that you will overweight in real estate and energy. Companies can use their profits to repurchase stock (to boost the price), invest in their company (to boost the price) or pay out dividends. Dividends are the least tax efficient of the three options. Buying and selling securities on the same day, online, on the basis of small, short-term price fluctuations. Day traders generally hold their securities for only one day. They close out their positions at the end of every day and then start all over again the next day. This prevents them from losing money when the market is closed. By contrast, swing traders hold securities for days and sometimes even months, and investors sometimes hold for years. Options are a type of insurance policy that you can sell or buy. They can limit your losses or gains or both. They can also be used to leverage your gains and losses. Buying a stock has a linear gain and loss depending on the stock price. With an option you can construct filters that will allow you to make money if the market goes up, down, or stays the same. You can buy and sell the options (like insurance). Many practitioners believe long term there is more money in selling and collecting a premium, than buying. I will go more into Option Trading and strategies in the next podcast. I’m going to participate in a webinar about stock picking today and I’ll let you know what I learn. From my experience, the market is pretty efficient – prices are based on the publically available knowledge. I know there are people making a living picking stock (and selling courses as to how to beat the market) but I’m skeptical that someone can consistently stay ahead of the market. That said, I will be doing research to try to find a profitable system. These professional stock pickers do no better than a coin toss. That strongly supports strategic asset allocation and possibly option trading.